FN+PGUP/ FN+PGDN to increase/ decrease its brightness. FN+ "-"/FN+ "=" to reduce/ extend the cycle, 4 levels available. Note: The LED backlit effect of LTC K828 keyboard has no memory function. It will back to its factory setting every time you restart the keyboard. ✔ Professional Gaming and Office Equipment. 104 keys, 19 keys non-conflict,removable keycaps,strengthened space key designed for better gaming and office experience. With built-in anti-ghosting technology, you can enjoy high quality games with quick response. ✔ Newest And Most Advanced RGB Multicolor Backlit Design. There are Six-zone dynamic RGB backlit modes and 9 preconfigured vivid RGB lighting modes allow you to choose immersive lighting effects. Besides, LTC-K828 has a voice control backlit function (FN+9); LED background light will flash through voice vibration frequency, which is super cool. ✔ Minimum Noise. 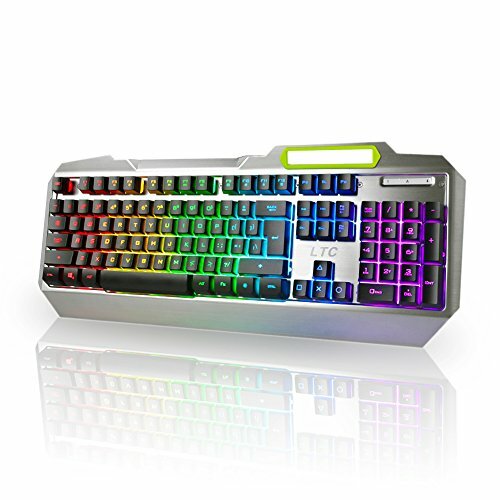 LTC-K828 keyboard is a professional mechanical feeling backlit gaming keyboard with the soft cushioned touch of a membrane rubber dome, which leads to minimum noise and satisfying feeling without sacrificing its performance. ✔ Waterproof: Aluminum alloy panel cover makes the keyboard waterproof, which makes it more durable and long-using life. ✔ Compatible with Windows 10, Win 8, Win 7, Win Vista, Windows XP and Mac OS. LeaningTech also provides 12 months warranty and 30 days no reason return. Customers' satisfaction is our goal.